SOMETIMES CAUSTIC, often controversial and always provocative, James Howard Kunstler is one of America’s most outrageous commentators on the collapse of the American dream. Whether sitting in the studio, strolling city streets, visiting a suburban mall or even “Happy Motoring,” his grim predictions are leavened by his signature sharp wit and cheerfully pessimistic humor. The reality of peak oil. 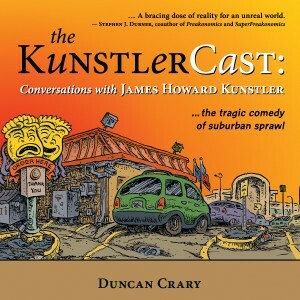 While readers may or may not agree with some of the more dystopian of Kunstler’s visions, The KunstlerCast presents an essentially positive message and is bound to inspire a great deal of thought, laughter, discussion and, hopefully, action. DUNCAN CRARY is a journalist, editor, and the host and producer of The KunstlerCast, a popular weekly podcast featuring James Howard Kunstler (author of The Geography of Nowhere, The Long Emergency and World Made By Hand). If books were made out of Cheez Doodles (the favorite party snack of KunstlerCast fans) this is what they would look like: bright orange, bite size, and sure to leave a tasty residue on all who touch it.